Dave Rave's first digital only single. 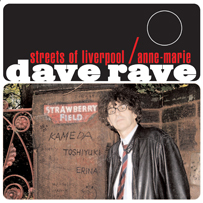 "Streets of Liverpool" is Dave's tribute to the musical moments he has experienced in the legendary city of Liverpool [YouTube]. "Anne Marie" was recorded in London and Paris with The Plastic Heroes and you can see the video the gang filmed in Paris here. Both songs will be on the new Dave Rave cd coming in 2010 on Bongo Beat as we become home to both his rock and jazz projects.